October 1902: he makes his first appearance on stage and receives the name of Ichikawa Otora IV. 1907: Otora joins a troupe led by Onoe Kikugorô VI. January 1909: Otora plays at the Meijiza the role of Sankichi in the drama "Shigenoi Kowakare"; the role of Sankichi's mother Shigenoi is played by Otora's father Ichikawa Metora II. April 1917: he becomes nadai and takes the name of Ichikawa Omezô IV at the Ichimuraza. November 1922: creation of the Tôeikai, a Kabuki dance study group led by Omezô and Onoe Eizaburô VII. The first program is staged at the Ichimuraza at the end of the month and is made up of one old dance and 2 new creations. March 1923: second dance program of the Tôeikai, staged at the Imperial Theater. April 1926: Omezô plays at the Hongôza the role of Momonoi Wakasanosuke in the classic "Kanadehon Chûshingura". June 1934: premiere at the Tôkyô Gekijô of Hasegawa Shin's drama "Kurayami no Ushimatsu"; Omezô plays the role of Oyone. His stage partners are Onoe Kikugorô VI (Ushimatsu), Bandô Hikosaburô VI (Shirôbei) and Onoe Taganojô III (Okuma, Oima). September 1935: premiere at the Kabukiza of Uno Nobuo's drama "Kôdan Yomiya no Ame"; Omezô plays the role of Tokubê's nyôbô Otoma [more details]. January 1939: Omezô plays at the Kabukiza the role of Tonami in the "Terakoya" scene of the classic "Sugawara Denju Tenarai Kagami". His stage partners are Onoe Kikugorô VI (Matsuômaru), Nakamura Kichiemon I (Genzô) and Nakamura Tokizô III (Chiyo). July 1944: Omezô plays at the Misonoza (Nagoya) the role of Otoku in the drama "Domo Mata"; the role of Otoku's husband Matahei is played by Onoe Kikugorô VI. September 1947: premiere at the Imperial Theater of Atsumi Seitarô's version of "Nansô Satomi Hakkenden"; Omezô plays the roles of Inuyama Dôsetsu, Inuzuka Shino and Yamashita Sakuzaemon Sadakane [casting]. July 1949: Omezô becomes the head of the Onoe Kikugorô Gekidan, a troupe founded a few days after the death of the illustrious actor Onoe Kikugorô VI. February 1950: Omezô plays the role of Mitsukuni at the Shinbashi Enbujô in the drama "Masakado"; the role of Princess Takiyasha is played by Nakamura Tokizô III. July 1951: revival at the Shinbashi Enbujô of Kawatake Mokuami's drama "Jitsugetsusei Kyôwa Seidan"; Omezô plays the role of the hinin Oguri no Umakichi [casting]. May 1952: Ichikawa Omezô IV takes the name of Ichikawa Sadanji III at the Kabukiza, playing in the drama "Onna Narukami". 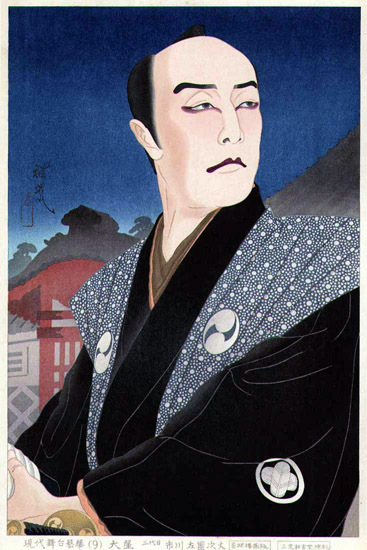 October 1952: premiere at the Kabukiza of Osaragi Jirô's drama "Wakaki Hi no Nobunaga"; Sadanji plays the role of Kinoshita Tôkichirô [casting]. March 1953: premiere at the Kabukiza of Osaragi Jirô's drama "Edo no Yûbae"; Sadanji plays the role of the hatamoto Matsudaira Kamon [casting]. 1963: Sadanji becomes the head of the Japan Actors Association (Nihon Haiyû Kyôkai). 1964: Sadanji receives the prestigious title of Living National Treasure (Ningen Kokuhô in Japanese). January 1967: revival at the National Theatre of "Narukami Fudô Kitayama Zakura"; Sadanji plays the roles of Fujiwara no Mototsune and Abe no Kiyoyuki [casting]. June 1969: Sadanji appears on stage for the last time, at the National Theatre, where he plays the roles of Motome and Kamatari in the drama "Imoseyama Onna Teikin". Ichikawa Sadanji III was a talented supporting actor able to play a wide range of roles, as a tachiyaku or an onnagata. His two fields of excellence were nimaime or wagotoshi roles. He was an important stage partners for stars like Onoe Baikô VI, Onoe Kikugorô VI or Onoe Shôroku II. In his latter years, he often played fukeyaku roles. Ichikawa Sadanji III's best roles: Yasuke/Koremori ("Sushiya"), Chûshichi ("Kamiyui Shinza") and Tokijirô ("Akegarasu Yume no Awayuki").